Art Deco Interior Design was the epitome of luxe and glamour. The mood during the early 20th Century was optimistic and hopeful, and it translated seamlessly into the realm of Interior Design. 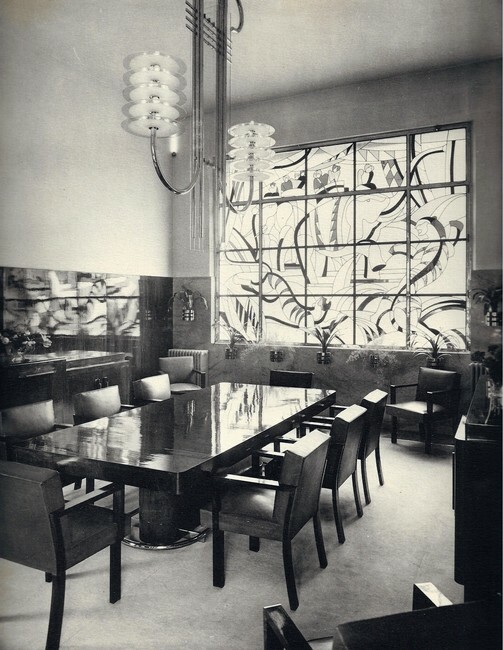 Like society's attitude, Art Deco interior design was sparkling and bright, literally! Scanning a room from top to bottom, you would first notice the sleek, glossy hardwood floors patterned with geometric shapes. As your eye traveled up, you would next notice the gleaming furniture - mirrored dressers, black lacquered cabinets, ebony veneer dining tables, glass and zebra skin chairs, chrome lamps and sparkling glass chandeliers. The French furniture designer, Émile-Jacques Ruhlmann's sleek and luxurious pieces are by far the most recognizable and definitive of the Art Deco style. Area rugs and other textiles were bright and colourful - zigzags, chevrons and sunbursts were popular motifs. Colourful art deco stained glass was found not just in churches, but in nightclubs, hotels, government buildings, elevators and residential homes. Furniture and other common household items all had a futuristic, modern look. Sweeping curved lines and angular shapes were a common sight. Brushed steel finishes and glass were used liberally as they contributed to the sleek, modern look. The look was very 'cocktail bar-ish' and in fact, this was the period that elevated the chrome and glass bar cart to 'must have' status for every modern residence. 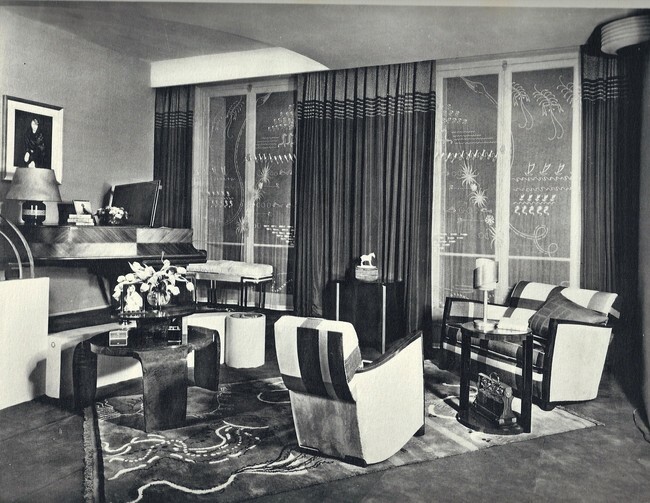 Overall, Art Deco interiors were modern and elegant - the epitome of cool glamour.